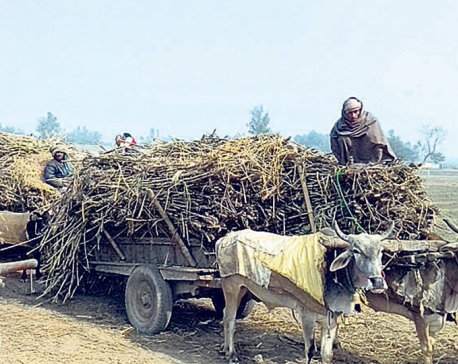 KATHMANDU, March 26: Sugar mills, including those that have not paid farmers for sugarcane, purchased many years ago, have pledged to settle their dues with farmers at the earliest. Mill operators made the pledge after Minister for Industry, Commerce and Supplies, Matrika Prasad Yadav, warned of action against sugar mills not paying farmers on time. The decision has come as a relief to farmers who are waiting for payments from the mills for their crop sold many years ago. Mills were found not paying farmers or making partial payment despite selling sugar produced by them. During a meeting with sugar mill operators and representatives of farmers held on Saturday, Minister Yadav had threatened to mobilize police personnel to arrest mill operators if they failed to come up with payment schedule immediately. Ministry officials say almost all the mills have, through letters and telephone calls, promised to begin distributing payments to farmers from April 5. The ministry, however, has not received such letters from ill operators as Sunday was a public holiday, Yadav added. Sugar mills started delaying payments to farmers from 2009 when farmers waged a series of strikes demanding fair price for their cash crop. As a result of the protest, the government started fixing minimum support price for sugarcane. This is probably the first time that a sitting minister has warned sugar mills, who have been making huge profit by leaving farmers high and dry, of strong action if they failed to pay farmers on time. President of Nepal Sugarcane Producers Federation Kapil Muni Mainali, who also attended the meeting with on Saturday, is hopeful that farmers will receive payment on time this year. “But I am still not confident because mills have been given about two weeks to start payment,” he said. 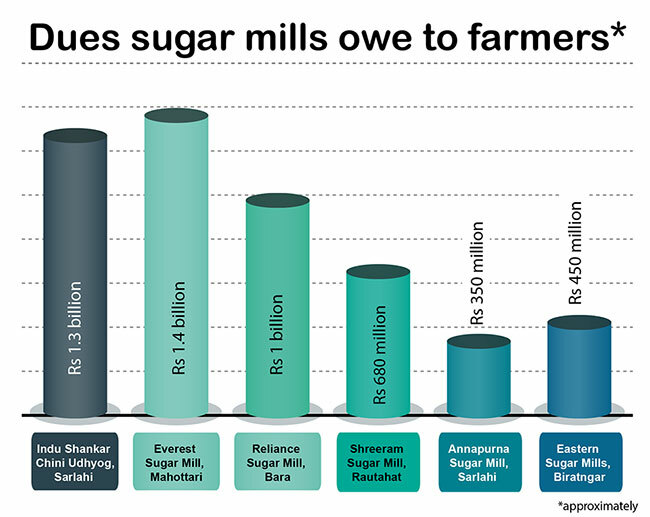 Mainali claimed that sugar mills owe farmers a total of around Rs 9.5 billion. Shashi Agrawal, chairman of Nepal Sugar Mills Association, could not be reached for comments despite Republica's repeated attempts through phone calls and text messages. Meanwhile, Minister for Industry, Commerce and Supplies, Matrika Prasad Yadav, told Republica that sugarcane farmers will get Rs 536.56 per quintal this season. “This time I will get the minimum support price endorsed by the cabinet,” Yadav said. Farmers say one of the reasons behind the reluctance of mill operators to make payment to farmers on time is the delay in fixing minimum support price. Government attempts to forge consensus. As it does not become possible most of the times, mill operators do not pay farmers until minimum support price is fixed. Minimum support price was Rs 531 per quintal last season. Crushing season begins from mid-November and continues till April. Nepal had produced 130,000 tons of sugarcane in the last season. Sugarcane production is estimated to reach 170,000 tons this year as many farmers are attracted toward this crop due to the attractive price of last season.